presents an “Officer of the Month” certificate to Officer Aubrey Auna. 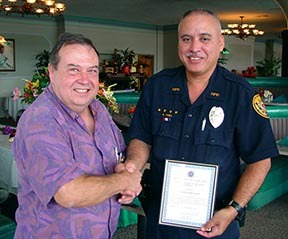 The Aloha Exchange Club of East Hawaii recognized Officer Aubrey Auna as “Officer of the Month” for September in a luncheon ceremony Thursday (October 25). 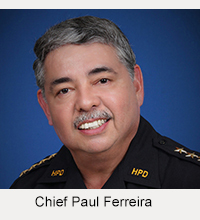 Auna was recognized for his work as a patrol officer in the South Hilo District. In May 2007, Officer Auna was assigned a series of financial crimes involving the unauthorized use of a stolen credit card number to purchase merchandise over the Internet. During the course of this complex investigation, Officer Auna served several subpoenas to various companies on the mainland and in Hawaii. 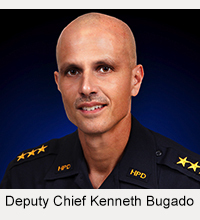 As a result of the subpoenaed information obtained, he was able to identify a suspect and verify that the merchandise purchased using the stolen credit card number was mailed to the suspect’s home. The cases were then referred to detectives for additional follow up and disposition.